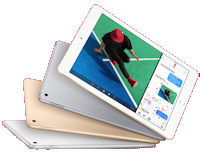 With a stunning 12.9-inch fully laminated Retina display and powerful A12X chip, iPad Pro is the largest and most capable iPad ever. It has fourspeaker audio, advanced iSight and FaceTime HD cameras, ultrafast wireless connectivity and Face ID so you can be more creative and productive at an entirely new scale. And iPad Pro is only 5.9 mm thin and 631 grams. iPad Pro comes with iOS 12, which has new multitasking features to make you even more productive - like Slide Over, Split View and Picture in Picture. New QuickType features work on the full-size onscreen keyboard to make formatting and text selection even easier and put shortcuts right at your fingertips. iPad Pro supports the new Smart Keyboard Folio, as well as magnetically attach and charge your new Apple Pencil 2 for those things that demand even more precision. 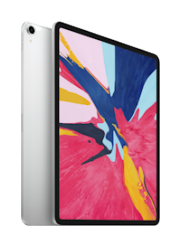 With a stunning 11-inch fully laminated Retina display and powerful A12X chip, iPad Pro is the largest and most capable iPad ever. It has fourspeaker audio, advanced iSight and FaceTime HD cameras, ultrafast wireless connectivity and Face ID so you can be more creative and productive at an entirely new scale. And iPad Pro is only 5.9 mm thin and 468 grams. iPad Pro comes with iOS 12, which has new multitasking features to make you even more productive - like Slide Over, Split View and Picture in Picture. New QuickType features work on the full-size onscreen keyboard to make formatting and text selection even easier and put shortcuts right at your fingertips. iPad Pro supports the new Smart Keyboard Folio, as well as magnetically attach and charge your new Apple Pencil 2 for those things that demand even more precision. Power isn&apos;t just for the pros... iPad Air brings more of our most powerful technologies to more people than ever. The A12 Bionic chip with Neural Engine. A 10.5-inch Retina display with True Tone. Support for Apple Pencil and the Smart Keyboard. And at less than 500 grams and 6.1 millimetres thin, carrying all that power is effortless. iPad puts all the computer you may ever need into a simple piece of glass. 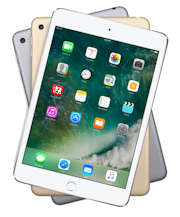 Both versions of iPad are incredibly capable, with desktop-class 64-bit architecture, gorgeous 9.7-inch Retina displays and all-day battery life. 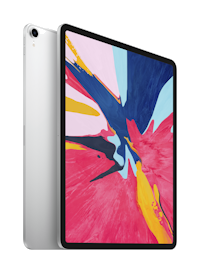 And the new iPad takes those capabilities even further with Touch ID, the fast A10 chip and new cameras - in a design so thin and light you have to hold one to believe it. Mini just got mightier... iPad mini is beloved for its size and capability. And now there are even more reasons to love it. The A12 Bionic chip with Neural Engine. A 7.9-inch Retina display with True Tone. And Apple Pencil, so you can capture your biggest ideas wherever they come to you. It&apos;s still iPad mini. There&apos;s just more of it than ever.